For many women, taking care of their nails is an important part of cultivating their appearance. That's why when nails get weak and break, it can be so incredibly frustrating. While women's nails are more prone to breaking than men's - possibly because men grow thicker nails, making them less likely to break - there are still ways to combat the many problems that may arise. 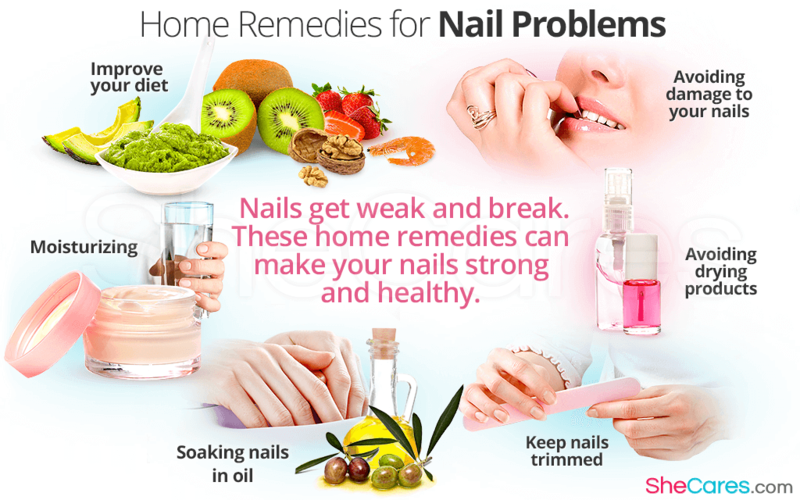 Keep reading to find out what home remedies for strengthening nails might be right for you! There is a wide range of reasons why nails might be getting brittle and weak. One of the most likely causes is that your nails aren't receiving the correct amount of nutrients that they need to thrive, but there are other potential causes as well. Aging and menopause can both weaken nails, and certain infections can sap nail strength as well. Since there are several different causes of weak, dry nails, there are also different remedies. However, regardless of the underlying cause of the nail problems, all of these remedies are likely to help your nails grow healthier and stronger. Improving your diet. Since vitamin deficiency is a leading cause of nail problems, adding those needed vitamins back into your diet will boost nail health. Foods like nuts, fruits, eggs, seafood, and even avocados can provide the needed nutrients. Moisturizing. Many people don't realize that nails can dry out just like skin, which makes them more likely to break. Paying special attention to the nails when using lotion is a simple but effective fix for nail problems. Drinking water helps hydrate nails, too. Soaking nails in oil. Several oils have nutritious properties that can help to build up nail strength, and many of them double as moisturizers, as well. Oils like vitamin E oil, olive oil, and almond oil are some of the best dry nail remedies. Avoiding drying products. Things like cleaning products, nail polish remover, and even nail polish itself can cause fingernails to dry out over time if they're exposed to these products often. It's best to keep exposure to a minimum to keep nails strong. Keep nails trimmed. Not only are longer nails more prone to breaking, but nails left to grow without trimming are more likely to have jagged edges that rip and tear. Trimming and filing nails helps to keep nail edges smooth and strong. Avoiding damage to your nails. Little things like biting and picking at nails, or even cutting cuticles, can do severe damage to the nail's strength and make it much more likely to break in the future. Be sure to treat your nails well and refrain from these habits. With these simple natural remedies for brittle nails, you can transform your nails and make them strong, healthy, and glowing.